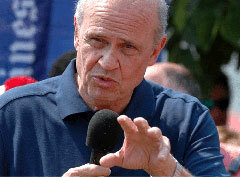 Was Fox News simply offering solid reporting on the inside baseball of the Fred Thompson campaign, or could there have been an element of payback for the candidate having blown off the Fox-sponsored debate last night in favor of appearing on NBC's "Tonight Show"? A Fox News article by chief political correspondent Carl Cameron [with AP input], Fred Thompson Campaign Makes Drastic Shift on Eve of Kickoff, paints a decidedly negative portrait of matters inside the Thompson campaign. Thompson appears to be losing his core of original supporters at a quickening pace. By "supporters" Fox is referring not to the broad electorate, but to campaign professionals who joined Thompson's effort early on. And it seems there has indeed been an unusually high level of turnover in staff ranks. According to the article, the latest to be let go is a former Fox News congressional correspondent, Jim Mills, personally recruited by Thompson and wife Jeri only a month ago. The gist of the article is that Thompson's campaign strategy shifted significantly at the last moment before his entry into the race, resulting in his decision to forego the Fox debate in favor of the Leno-show announcement. Also, rather than pursuing a "new media strategy," Fox reports that the campaign decided to go with a more traditional "corporate" approach, and that this has riled a number of "Fred Heads." I expect that as the Thompson campaign unfolds, the candidate will get "fair and balanced" treatment from Fox. But in the short run, there could be some ruffled Fox feathers for Fred to fix. Prediction: look for Fred to turn up for an extended interview, perhaps with D.C. managing editor Brit Hume, sometime soon.